This guide has been updated as part of the Grand Crosslinking. The original version of this page can be found in archive form here. The format has been completely overhauled. Icons have been included, most of which were taken from each GOI's respective hub or provided by djkaktus. After each entry, in the bottom right hand corner, is a "Back to Top" prompt that will take you back to the table of contents and make navigation easier. Crosslinks to relevant tales or documents have been added as in-line edits within the blurbs for almost every GOI. Many thanks to Roget, WrongJohnSilver, and Jacob Conwell of the WikiWalk team for their assistance and suggestions on how to improve this, and to TroyL and Decibelles for oversight and approval. Also, a big thanks to djkaktus for their artwork and for helping with the format, and a special thanks to everyone who has created a GOI over the years! What do you guys think about using the RPC Authority and the AEP Association as GoI's. They technically compete with the foundation, right? With regards to the AEP, at least, we're not going to put a spinoff wiki that you created and put like, the most minimal amount of effort into on the big bad GOI list. If you get some members and serious content and it gets some representation on site, then it is a possibility, but right now there is pretty much nothing. RPC Authority isn't a concept that we came up with. If the creator wants to bring their concept over to our wiki, they're more than welcome. For now, both of us are making content and charting our own courses. While I appreciate the sentiment of being included on the site, The RPC Authority is a standalone site and has no intention of existing within SCP lore. The code on the tables really needs work. You can't change pages on the tables without the entire page reloading and sending you back up to the top, as well as closing the collapsible. Also, I'm disappointed that this revamp essentially copy/pastes most of the descriptions from the old hub over, despite the GOIs evolving since their introduction. Like, what's the point? New graphics and code that actually makes it harder to navigate the page? Downvoted, both for the technical issues, and for making me wonder if this entire new Foundation endeavor is even remotely worth it. I'm all for change, but this isn't change, it's just putting up some new wallpaper while keeping the furniture. E: Also, the tables say "SCP Number", despite the fact that it lists all documents about that GOI. Gamers Against Weed is mostly tales, so it's especially noticeable there. As with the MTF page, the images are way to big. Additionally, there's a massive amount of incongruity in some of the pictures. Having logos for the GOIs that have them makes sense, but having a hand-drawn image of a random smokestack (The Factory) or a cartoonish drawing of someone saying "I'm just a Nobody" (Nobody) in what is supposed to be an official Foundation document is wildly out of place. Edit: Also seconding Ihp that most of these blurbs need a massive rewrite, and at this moment in time this page is actually worse than the old page. I know that I've raised these concerns in chat, and that a rewrite of at least one of the blurbs is supposed to be coming, but it bears repeating on the mainsite. Edit 2: Also there is still no centralized hub for GOI format articles, despite repeated promises that one would be forthcoming, including at least one assurance that it would be part of this page. Noticed that the new collapsibles do include GOI formats, although perhaps not as prominently as I would like. There's still the issue that these tables are really difficult to use. If possible, I would advise abandoning the ListPages module and having jarvis maintain the list, similar to the way that the Tales Hub is done. And we're back to the old status quo. Seriously, when are we going to get a hub for GOI format articles? I'm willing to do it if staff don't have time to. I ended up doing it. Edit 3: On reflection, of the "new" pages, this is the one I am the most disappointed in, because it had the potential to bring so much positive change (centralized GOI format hub, updated and rewritten GOI blurbs, etc…) but instead it ended up being a step backwards from the old page by just copy/pasting the old blurbs, hiding them underneath far-too-large images (which will eat up the bandwidth of our readers with poor internet connections or reading on mobile), and wrapping the whole thing in code that makes it harder to navigate the page itself. Edit 4: With Roget and Decibelle's permission, I've updated and revised the Prometheus Labs blurb. However, as it stands, there are still many many other GOIs that need their blurbs revised, most notably UIU, the Factory, and Doctor Wondertainment. Edit ? : The new UIU blurb is a marked improvement over the old one, although I would still like to see it polished a bit more, perhaps by one of the more experienced UIU writers (like Ihp). I will update this post if and as these issues are addressed. All of my pressing concerns have long since been addressed. Updating this post to reflect this. I've always considered these pages to be both in- and out-of-universe references. It's strange that there's nothing on here for newer readers to reference for a GOI that has 3 mainlist SCPs attached, as well as its own format. About time this got an update. Need to ditch the paging inside the collapsibles, but this is awesome otherwise. 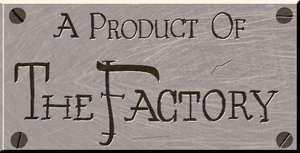 Particularly dig the idea of having the logos there; I actually made one for the Factory a while back just for fun that I can dig out and clean up, see if people like it. Like I said, I did these for fun as part of another thing I did, but figured since it doesn't have one I'd throw these out there. I was also thinking a sheild-type thing with just the scythe 'F' might be cool if we want something simpler. I don't think the Factory in-universe would have a logo. To my understanding or at least in my canon "The Factory" just refers to a set of items that have been sourced or are believed to have originated from some eldritch manufacturing entity. If anything they might have a mark of some kind. If anything they might have a mark of some kind. One of the major things in consumer culture (the heart of the Factory) is branding, so you always have some signature Corporate Logo that gets stamped on everything. To wit, the in-universe items typically have "A product of The Factory" or just "The Factory" stamped or embossed somewhere on them, which is what these are my take on. I went with a sort of old-school art-deco/art nouveau hybrid script, to match that vintage-but-timeless vibe they always have; it's somewhere between a Victorian hand and an old typewriter/machine press script, but with a little bit of modernist streamlining. The scythe F is the part that I'm really trying to pimp proud of: If you asked the original non-anomalous company that the Factory metastasized out of, it represented "blah blah reaping the bounty of nature blah blah abundant harvest for all blah blah fruit of man's labors…". The heart of consumerism, basically: "greed is good". The Factory is the twisted corruption of that into the other meanings of the scythe. I ended up using the shield-with-scythe-F stamp a couple of places in this painting because it worked better visually than "The Factory" (which was hard to see). Not gonna lie, not a huge fan of a lot of the changes made. Logos for GOIs should be about the same size as the Foundation logos at the top, perhaps slotted in to the left of the actual descriptive text. Missed opportunity to update blurbs. Pagination on the listpages modules is a bad idea. In fact, why is anything except %%title_linked%% even necessary? Wikidot tables really clash with the aesthetic. The links to the tags are redundant with the listpages modules. Surely there's some CSS magic that can spruce up that table of contents? It's ugly for such a nice-looking page. There isn't a missed opportunity, it just doesn't have staff who have volunteered to take on the project, and so far, we haven't seen it as a big enough priority that admins want to muscle in and make the team captains assign some people to the job (which we do, sometimes). Therefore, if anyone wants the blurbs updated, please make suggestions on this page. Just keep in mind it may be heavily edited (or may not be, or may be edited at a later time, at staff discretion). Ihp contributed one for the Chaos Insurgency here, for example, and it was extremely helpful. See above: it's still on our list of things to do, but has not yet been considered a significant enough priority for admins to request team captains to make it a priority. This revamp was done by the Wikiwalk team (with approval from the appropriate teams except, unfortunately, the Technical Team), and they did not prioritize rewriting the blurbs. Rewriting these blurbs would be on the Rewrite Team's slate, but they have not presently chosen to prioritize it, and are not currently required to do so. Though anyone of course may request that that Team do so, and stating here that I am willing to assist with that, similar to how I did editing work on Ihp's proposed rewrite linked above; I also made some minor edits to the GAW blurb with input from Communism will win, who was very helpful there as well. For what it's worth, I always liked that the Factory had such a short entry. Makes it more ooky-spooky mysterious. The Fifth Church, also known as the Church of Fifthism or the Fifthist Fellowship, is a highly secretive religious organization-. Is it? Even if Fifthism is a church, it's definitely not a unified church. The highest rated Fifthist articles seem to imply many different sects with varying beliefs, and the top rated one is based on new age spiritualism. I think this goads people into writing more Scientology parody instead of good Fifthism. I have a problem that a lot of these logos might be taken as official, or at least there was no consensus or community feedback on them being posted. I think if we're going to post a logo next to a GOI description we should at least have some sort of community voting process for each one. I think it's more than a nitpick, While I guess some of the new ones might look okay it's not entirely in the collaborative spirit of the wiki. Some GOIs don't even need logos. Maybe a distinguishing mark of some kind. Most GOIs don't have an organized structure or a corporate marketing team. Did the Factory pay their graphic designer intern $20 to make some vectorized smokestacks with a rust overlay? Did they want it mustard yellow? Did they want to go with the letterword instead? Can someone please write that tale so I can read it? I don't think a lot of the logos even help, or if you even need them there to begin with. It looks sterile, I'm not seeing how it adds any flavor. Why are you using letterwords - these logos are listed right next to the GOI. Why the color matte boxes instead of just white space?